Previously revealed at the Summer Wonderfest back in July, Evolution Toy have now revealed official images for their new articulated Fireman, Zone Fighter and Redman figures that make up the first wave of their new HAF line. First up is the 1973 Tsuburaya hero Fireman (known as Magma Man in some areas), who will be released in December 2017. Fireman comes packaged with five sets of alternate hands, Fire Knife, Fire Jack and 2 Fire Bracelets. Next up in January 2018 is the 1973 Toho hero Zone Fighter, most well-known for his team-ups with Godzilla against King Ghidorah and Gigan. Zone Fighter comes packaged with three sets of alternate hands and his Ryusei Missile gauntlets. 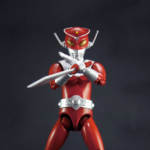 Finally in March 2018 comes the feared Tsuburaya kaiju killer Redman! This infamously brutal hero comes packaged with four sets of alternate hands as well as Red Knife and Red Arrow weapon parts. All three figures retail for around 9072 yen each, but various stores are offering discount on those prices. Will these lesser-known heroes be joining your collection? Check out the full selection of images and let us know after the jump!